If life were like the internet it’d be really bizarre. Imagine someone following you around, taking notes on everything you did, everything you touched, everywhere you went and who you talked to. It’d be strange and it’d make it a lot harder to get things done. Fortunately, life isn’t like the internet. The fact that data on our habits is collected makes it easier for us to have a better online experience and communicate with consumers. For startups especially. Understanding what your customers are doing can make or break you in those early days. The thing is startup analytics are difficult. Startups tend to have less resources to build in-house teams to measure and assess analytics. At the end of the day, no matter how much you love what you do, you need to get results. Maybe it’s getting purchases, or maybe it’s sign-ups but whatever it is, there is some concrete, numbers oriented goal. For Hubstaff, it’s revenue generating events. The tricky part is, in a day and age where so much business is done online it’s difficult to understand what interactions are equating to these results. Brick and mortar stores and high touch sales give you a pretty clear understanding of what is working. You can easily see how changes to a sign or sales strategy affect your bottom line. Online it’s a little trickier, your webpage becomes your place of business and you have to figure out what people are doing when they’re on it. That’s where data comes in. A lot of the tools we use revolve around data (see how we use Intercom for customer analytics). There’s Google Analytics, Kissmetrics, Mixpanel and a whole host of others. Most businesses use more than one of these tools. The allure of data is never ending. People want to know what is happening when people go to their site. How do you get people to do what you want them to do, simply through a screen? When people come to the Hubstaff homepage we want to be able to bring them value. Whether that’s getting their organization set up with Hubstaff or connecting them with developers, marketers or designers that can help grow their business. Every day a lot of people come to the Hubstaff main page and a lot of people leave without doing anything. And for every page that those who stick around visit after that, the same thing happens. Sure, there are a handful of people who are irrelevant(maybe they came to the page by accident), but that also means there were people who left who we could have brought some value to that we missed out on. Our goal is to be able to communicate our value in a way that stimulates action and ends in a revenue generating event. For this we turn to Mixpanel. A little background on Mixpanel. Mixpanel was born from the legendary Y Combinator accelerator, which also is responsible for mega companies like Reddit, Dropbox and Stripe. The goal behind Mixpanel was to make tracking user behavior (an activity once reserved for large, heavily funded organizations) to companies large and small, no matter how limited their time and funding. In case it’s not clear yet, Mixpanel is an event-centric platform where tracking is not automated and is based on events. 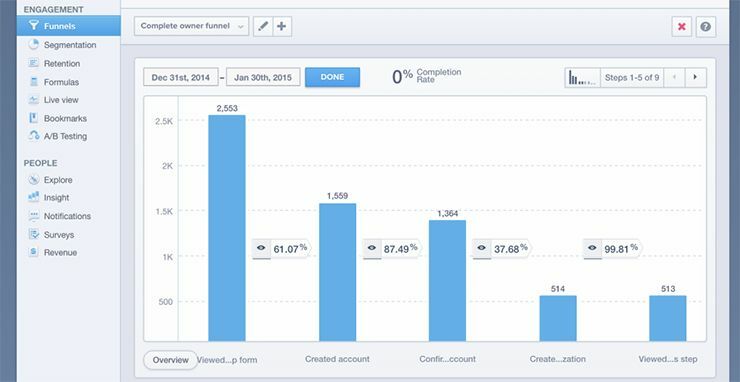 We use Mixpanel to track events, create sales funnels and see trends. Mixpanel is more targeted than Google Analytics and the data they provide offers lots of possibilities. There are millions of events and insights that Mixpanel can help you gather. How many people are clicking the sign up page after visiting the features page? Where are people dropping off during a particular sales funnel? What referring sites are giving us the biggest ROI? Where do customers with the longest lifetime value come from? The sign-up language isn’t clear enough. People are dropping off at the pricing page. Australian customers have a higher lifetime value than those from the United States. These tidbits may seem like they contain a fair amount of inference, but for us they are like striking gold. Take the Australian customer example. When we look at revenue generation by country, at first we see what we already know. The majority of our revenue generating events come from the United States, but then it also tells us that the runner up (albeit by a large spread) is Australia. On top of that, the Australian customers have a higher average revenue per customer. That’s a huge piece of information. We might be able to focus more of our marketing on these channels and the Google adword for “time-tracking” might be less expensive in Australia, so we save ourselves money and reach a higher revenue generating client. The major thing you’re probably wondering is- why Mixpanel? 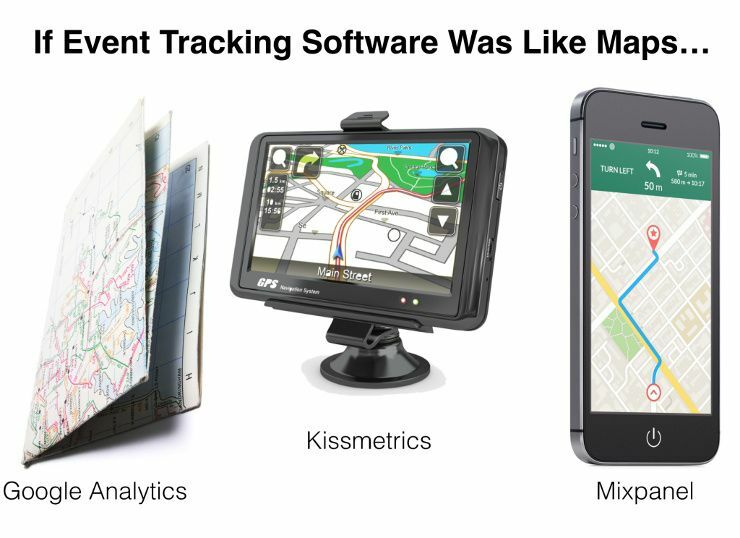 Why are we using Mixpanel when there are other startup analytics tools that measure the same things. The answer comes in two parts. First, as I mentioned before, we use multiple analytics tools. 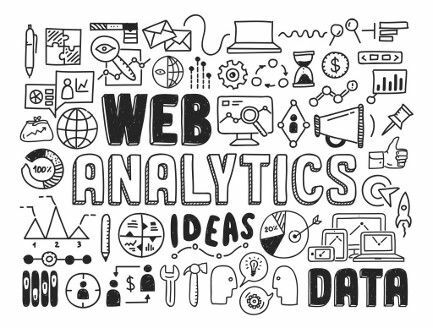 We still use Google Analytics (see how to quickly setup Google Analytics on your website) and we are also working on Trak.io. The real answer though is that for events based analytics we like Mixpanel for its clarity in creating funnels and gathering insights. The UI/UX is pretty spot on and the reliability of the data is good. To come to this conclusion we weighed Mixpanel against some other alternatives. Before becoming Mixpanel users, we went through a whole spectrum of events based tracking tools. Essentially, all of these tools have the capability we are looking for. We use Mixpanel because it’s the easiest and that’s the whole point of having a tool. You can track events in Google Analytics, but really it’s built more for e-commerce type sites. It’s tricky to figure out how to put everything in place. It happens in the behaviors tab and you create an events flow. On one screen you see all the potential pathways. With the right amount of time, desire and effort there’s no reason that Google Analytics can’t give you everything you get from Mixpanel, but who has that time? Kissmetrics was a pretty similar situation. It was more streamlined than Google Analytics. The software is definitely there with Kissmetrics but the referring domain data was a little unreliable. A lot of the time we didn’t get any referring domain information at all, while Mixpanel seemed to give us more real-time data on where people were coming from. Getting set up on all these different tools can be a real hassle. Which might keep some people get locked in place, but Segment.io has streamlined the process by allowing us to easily gather data without having to code each new tool, completely transforming the plumbing of the site. This gives us flexibility in testing out new tools and figuring out what works best for us. It also means we can change our mind in the future. Mixpanel operates on a share the love type model. As long as we have less than 500,000 events and we put an icon on our homepage, we get all these insights free of cost. How you choose to utilize funnels depends on your business objectives. 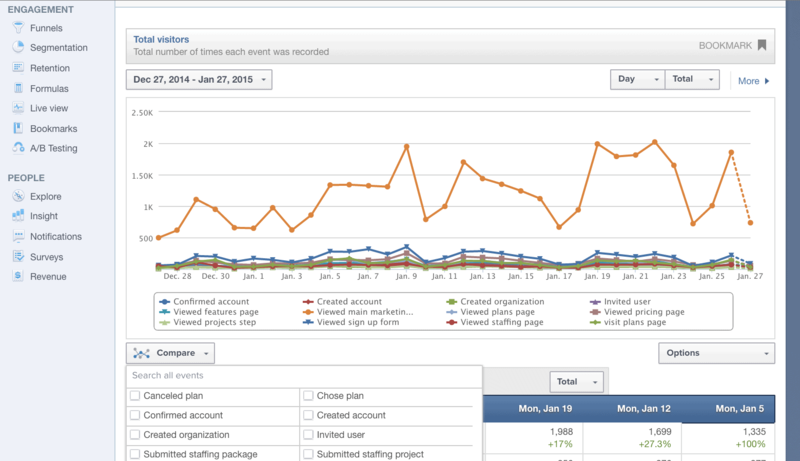 At Hubstaff, we’re interested in funnels that end in revenue generating events. This allows us to visualize how people are getting to our checkout page and where customers are falling off in the process. If we decide we want to add a new funnel, no problem. 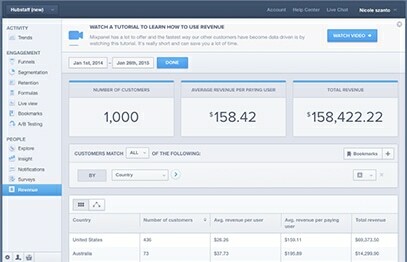 Mixpanel allows you to implement new funnels and create reports that use historical data. One of the most valuable parts of funnel utilization is understanding where our paying customers are coming from. Referring data leads to incredible insights. For example, we can see how many people that arrived on our homepage from and advertisement ended up completing the sign up process. Referring data also allows us to compare different sites that we are affiliated with or advertising on and see which marketing outlets result in customers with a higher lifetime value. Another facet of referring data is understanding how our users go about engaging others. With Mixpanel we are able to see if users on our site are sharing our information through social channels and if they are inviting people to their Hubstaff organization. The important thing is not really the data but what we do with it. With the data and reports compiled in Mixpanel we are able to draw conclusions and test new assumptions. In our “complete owner funnel” for instance we can see that there is a pretty decent drop off between the confirmed account event and the creating organization event and we can test new processes in order to remedy this issue, maybe we change the e-mail language or the create organization user experience. There are a lot of possibilities but by understanding the specific event we can more effectively test our assumptions and see results. The power of Mixpanel lies in its ability to go beyond page views and dig deeper into questions that give actionable answers. What separates the trends page in Mixpanel from other tools is that it allows you to analyze different events overtime in relation to each other. Data is not one size fits all, it is extremely dependent on the type of organization. Hubstaff’s Mixpanel events will be drastically different from a gaming site or e-commerce site, but any of these organization will be able to benefit from the visualization of Mixpanel, as it relates to their unique data points. People are the key to any busin ess. Whether it is the people that work for you or the people that you are targeting. Different people, behave very differently so it can be hard to draw conclusions. You can waste a lot of time trying to make proud assumptions on why people are behaving a certain way. Mixpanel gives you a new lease on understanding your users. Not only are we able to see who they are and what they have done in our app, we can group them by activity profiles and analyze the lifetime value as it relates to specific variables (i.e. country). This shows us areas we should be more active and which affiliates are having the greatest impact on our bottom line. There is a lot of great stuff that Mixpanel does that we don’t use it for. They have a whole notifications and surveys sections that allows you to communicate with your users while they are in the app, but we use Intercom for that (get more info on how we use Intercom). Mixpanel also allows you to do A/B testing and create formulas but we don’t utilize these features either. Right now, we find Mixpanel offers us major insights into what people are doing on our site and making changes that will inevitably improve our ROI. As we continue to test out our assumptions and tighten or funnels with Mixpanel, I’m sure we will find even more ways to utilize it. Event tracking tools are quickly becoming a huge part business and the industry is sure to evolve over time. As we continue to utilize Mixpanel, we have already seen other players jumping into the space, such as Trak.io, whose beta we paid to be a part of. There’s no saying what will happen and how we will be able to apply event tracking to business in the future, but as things continue to evolve we’ll do our best to keep you in the loop.